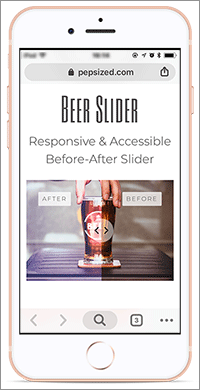 See the Pen BeerSlider - before-after reveal slider - code source, basic demo by Paulina Hetman (@pehaa) on CodePen. See the Pen BeerSlider - use with jQuery and various start parameters by Paulina Hetman (@pehaa) on CodePen. See the Pen Background Comparison by Paulina Hetman (@pehaa) on CodePen. See the Pen Full width full height before-after slider by Paulina Hetman (@pehaa) on CodePen. See the Pen Circle before-after slider by Paulina Hetman (@pehaa) on CodePen.